When you live in the St. John’s, FL area, you need air conditioning repairs completed fast and flawlessly. You don’t need to cope with hot weather, sticky conditions, elevated noise levels, strange smells, or leaking condensate. With emergency air conditioning repairs from Air McCall, you’ll be able to get pleasure from a calming weekend and a peaceful night of sleep in no time. pushing aside calling for skilled assistance not solely prolongs your discomfort but also can result in unnecessarily high energy bills and a lot of expensive repairs. At the first sign of a problem, call the NATE-certified team from Air McCall Our qualified professionals utilize factory training, years of expertise, and advanced tools to quickly and accurately establish and resolve everything from minor to complicated problems. Get the most out of your cooling system with professional air conditioning repairs from Air McCall! Most air conditioning systems are very reliable, however cooling systems are complicated appliances, which implies any range of things will go wrong. Malfunctions are most likely to happen on the hottest day of the year, because of intense use. Lack of maintenance can cause wear and tear and a build up of contaminants, causing the system to work tougher, lose efficiency, and probably have adverse effects on indoor air quality. Squealing sounds or grinding noises are often a sign of several problems, like improper alignment, worn parts, or faulty motor bearings. algae thrives in the moist environment of the condensate drain, which may cause a blockage, water overflow, and property damage. mold and mildew, that forms on cooling coils, can restrict airflow, diminish capacity, and waste energy. Our team is factory trained, fully insured, NATE-certified, background checked, drug-free, and courteous and skilled. We know these are necessary values to you, therefore all of those are a part of Air McCall’s trusted services. As a Carrier factory authorized Dealer, we receive regular, in depth factory training, which permits us to quickly pinpoint problems, create accurate assessments, and supply long term solutions. We will always keep you informed, provide insightful, knowledgeable recommendations, and solely proceed with your consent. We have maintained an A+ rating with the better Business Bureau and have been recognized with Carrier’s most prestigious recognition, the President’s Award, three separate times. The Carrier President’s Award singles out dealers who exceed Carrier’s high standards, informative sound business practices, product understanding, high client satisfaction scores, and technical expertise. Have your HVAC system repaired efficiently! Our goal is to repeatedly raise the bar of our customer’s expectations. By being responsive to service calls with dedicated, qualified, and prompt response throughout St. John’s, FL, we keep our community comfortable, despite the weather outside. 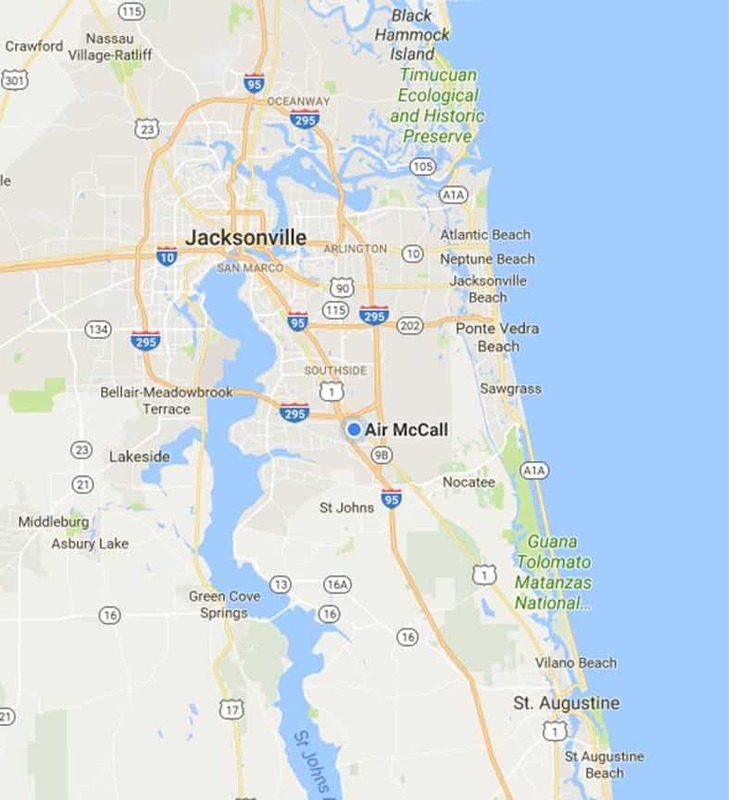 Air McCall is a local, family owned business, and we use a team of NATE-certified professionals who work along to supply a dependable network of support. We provide free estimates and free second opinions, striving to eliminate stress from any issues you may have with your cooling system. Through professional workmanship, outstanding products, and 100% commitment to our client’s satisfaction, we deliver lasting solutions to the most advanced cooling issues.